An effective, safe, and natural cream for the temporary relief of pain associated with shingles. For many people, the shingles virus often causes extreme pain and discomfort and the search for a treatment to ease the suffering is frequently met with disappointment and continued agony. 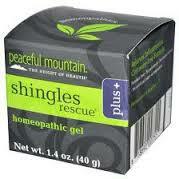 Shingles Rescue Plus contains homeopathic components specifically chosen to provide pain relief and healing support. It also contains specific herbs selected for their skin soothing properties. (berry), Poke (root), St. John’s Wort (aerial parts), Vitamin C, Vitamin E, White Willow (bark), and Yarrow (flower) in a water-based gel.